Exact dosages of diamond particles are evenly distributed on a one piece shank of hardened stainless steel. The ideal relation of the protruding and embedded part of the diamond particle ensures a long lasting low vibration performance. Besides the standard grained Robot Points (S, without shank marking), there is a range of super coarse (X, black banded shank), coarse (C, green banded shank), fine (F, red banded shank) and superfine (V, yellow banded shank) diamonds. Robot Points for minimally invasive therapy were developed for the maximal protection and preservation of healthy tooth substance. Six special shapes are available for the fine preparation of wedge shaped defects up to occlusal cavities. The differently shaped, delicate abrasives have a very homogeneous grit (100 µm, standard). The very short head length (0.7 – 2.0 mm) and a slender shank neck ensure an unimpeded view on the prepared surface. 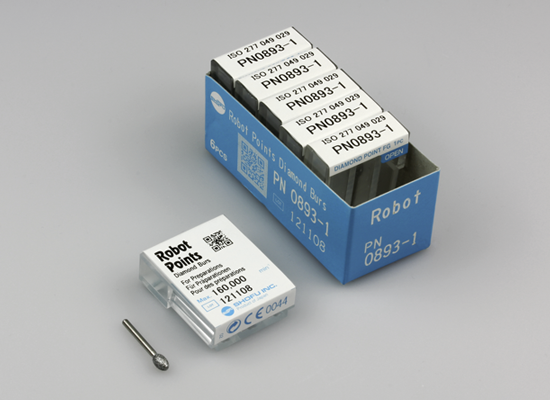 For the precise preparation in the sense of the MiCD concept these Robot Points are used at a maximum speed of 300,000 rpm. Robot Points should always be used intermittently with low pressure and water cooling.